For the majority of skibikers their first skibike is a mountain bike converted into a skibike, luckily there are now more ways to do this than ever before. Alpine Skibikes pioneered relatively inexpensive and well made diy skibike conversion kit. 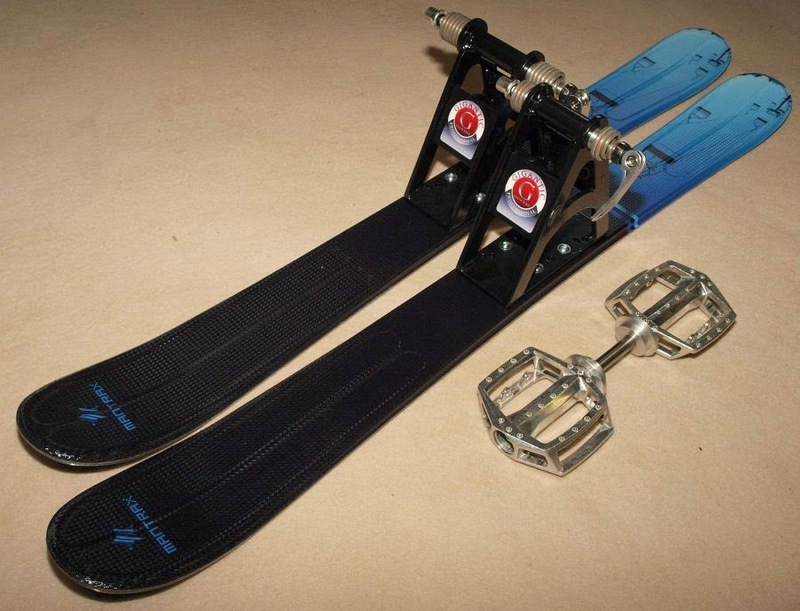 Founded in 2001 in Los Angeles by inventor and snow-riding enthusiast Matt Hanson, Winter-X-Bike, Inc. unveiled its revolutionary Ski-MX Conversion Kit, which turned any bicycle into a ski-bike, in early 2002. Over a decade later the design is still going strong and probably more of the Alpine Skibikes kits have been sold than any other type. Canadian manufacturer Bike The Slopes make no bones about their mission, they are producing low cost skibike conversion kits to introduce as many people as they can to the sport. Once hooked you can always upgrade to another conversion kit or even go go the whole hog and buy a dedicated skibike. Swiss based manufacturer Bull Skate have been producing skibike conversion kits geared towards the more extreme end of the market for many years. Unusually, they also have an ever expanding empire of rental stations across Switzerland, which have already attracted pro bike riders from around the World to sample the joys of skibiking. 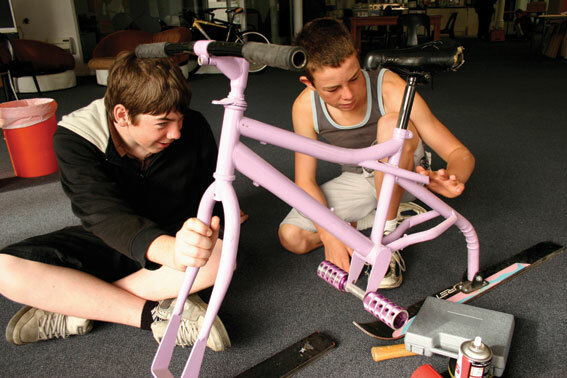 Drifter Snowbikes offer skibike conversion kits and skiboards suited to BMX bike based skibike conversions. 100% designed, manufactured by BMXers for BMXers... Matt Beringer machines the hollow axles and speciality parts. Imagine buying a product not only endorsed by a legend, but built by one. Constructed from 100% full USA grade chromoly, utilising use aircraft grade for highest strength to weight ratio, with a Deck Return System to keep the boards where they need to be, allowing aggressive carving and locked manuals. With 23 years R&D experience Drifter Snowbikes claim to be light years ahead of any competition. Gigantic Professional are a Czech Republic based outlet for a wide portfolio of sports and leisure items, part of which is their skibike conversion kits. 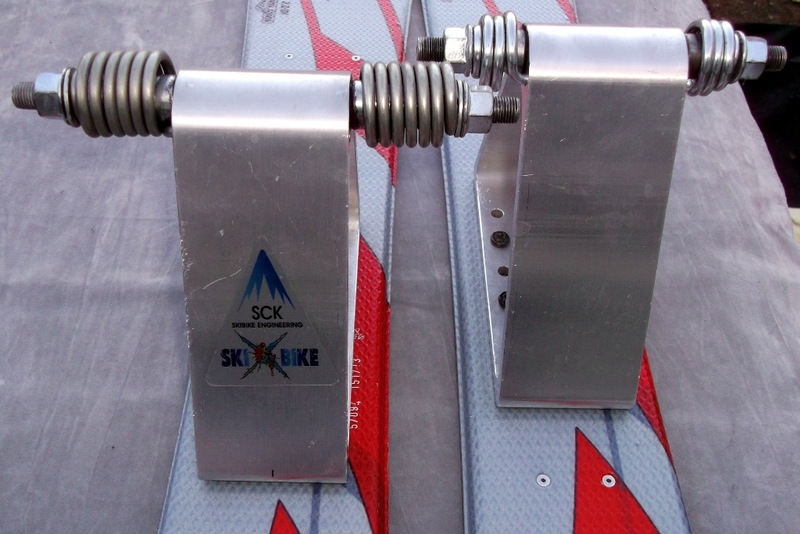 The ski adapters are constructed from steel and they are somewhat more heavy duty than some of the alternatives. Gigantic Professional are a respected brand in Europe with many devoted users with sales representatives in the Czech Republic, Sweden and France. NISM set out to design a skibike that feels as bike-like as possible without sacrificing the control of skis in the snow. With this philosophy in mind the NISM patent pending designs allows you to be able to sit at normal ride height with the crank, chain and pedals still remaining attached whilst maintaining tension from your chain so you don’t feel like you’re slipping out of gear. NISM offer two types of mountain bike based skibike conversion adapters; a tall adapter to keep the ride height the same as when on 26" wheels and a lower ride height for less extreme riding and a BMX skibike adapter. NISM also offer patent pending designed asymmetrical skis built to work as one ski to give you the best turning and stopping possible whilst still providing the agility of a normal bike. NISM skibike ski - providing the agility of a normal bike. 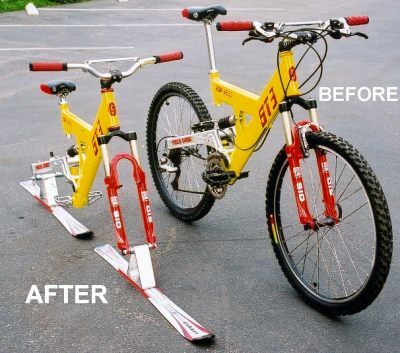 Skixbike are a Russian manufacturer who produce an unlicensed version of the original Alpine Skibikes conversion kit. There is a tiny difference in size, their version being about 1cm lower than the original, BMX knurled stunt pegs are supplied as foot rests with the kit. The level of grip supplied by these foot rests is considerably reduced due to their ability to become icy after a few moments of use. Whilst it gives great pleasure to build low budget ghetto skibike creations and ride them at the local sledging hill, it is unwise to take them to a mountain resort where they are very likely to be a danger to both yourself and other snow users and do great damage to the reputation of skibiking as a legitimate winter sport.